Upon reflection I decided that the point of a blog is personal, intended to pass on information that I was actually part of. With this in mind I continue with two duets from the very early days of my “career” as an improvising saxophonist. 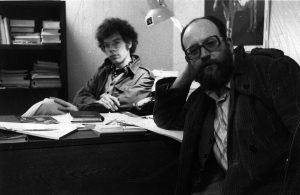 These two Canadian artists – bassist David Lee and sound-singer Paul Dutton – played important roles in my decision to develop a musical form in Toronto’s very conservative milieu of the 1970s. Throughout the existence of N.A.M.E. [New Art Music Ensemble] eventually to become the Bill Smith Ensemble, my constant companion was David Lee. Not only as a bassist but a close friend and confidant, organiser and co-editor of Coda Magazine. We played hundreds of gigs in Toronto art galleries, pub back rooms, cafe’s etc. and toured Canada, the USA, England and Holland together. Often with David Prentice [violin] and Arthur Bull [guitar]. The provenance of the following two pieces are unknown, very likely casual get togethers or rehearsals in the late seventies/early eighties. 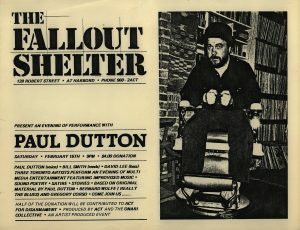 Paul Dutton is in many ways an artist outside of my immediate “jazz” circle. His original claim to fame being quarter of the legendary sound poetry group The Four Horsemen [https://www.youtube.com/watch?v=ahUdQd_YtwM] with bp nichol, Steve McCaffery and Rafael Barreto-Rivera. Paul led me down other paths and introduced me to artists seriously removed from the jazz world, including the Four Horsemen, and on the evening of Tuesday, October 14th,1986 a tribute to bp nichol at Harbourfront introduces me to the English sound poet Bob Cobbing. We’re number 8 on the program. A year later I found myself in London performing with guitarist Arthur Bull, a tour of venues in and around the city, one being at the Makeshift Club in a back room of the Duke of Wellington, Balls Pond Road (10th October 1987) with the performance group BIRDYAK featuring Mister Cobbing, his wife Jennifer Pike dancing, invisible inside an extra-large paper potato sack and sound terrorist Hugh Metcalfe [guitar, violin and gas mask] who, in memory, played dangerously with exposed electric wires and a bucket of water. The following two duets with Paul were recorded at a college radio station. Unknown location & date. Late eighties/early nineties. The pieces were inspired by the writing of James Joyce. These four pieces have been digitalized from cassette tapes. To receive automatic notification of new postings please go to my home page at http://rantanddawdle.ca and become a subscriber.